After Breakfast, move towards Highest Motorable Road of The World, KhardungLa Pass. Have some Tea there, get yourself clicked with the Khardungla Signboard by BRO and continue towards Nubra valley covering Deskit Monastery enroute. Registration at Hotel/Camp, spruce up and later you can have a Double Hump Bactarian Camel ride. Dont neglect to click this distinctive craniate, found in chilly Desert. It was once used to convey the exchange material on silk course. Overnight stay at Hunder/Nubra Camps/Hotel. After Breakfast, check out from the camps & visit Deskit Monastery, Hot Water Springs, Panamik via convergence of Shyok & Nubra River across Sumoor. Return to Leh by Evening. Overnight stay at Leh. After early Breakfast proceed for one of the most beautiful & scenic, Salt water Pangong Lake at Spangmik via Changla Pass (17350 ft). Various Bollywood movies have been shot at this lake. 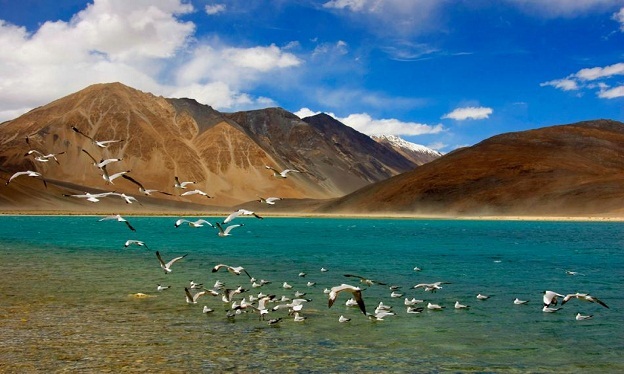 One-Third of this lake is controlled by India & rest of the two-third lies under Chinese province.You will reach there by noon, enjoy the spellbounding view of the Lake & post lunch Start your return journey to Leh. Overnight stay at Leh.